Inga is a successful artist from a family of Hollywood greats; she has always thought of herself as an artist and a teacher. 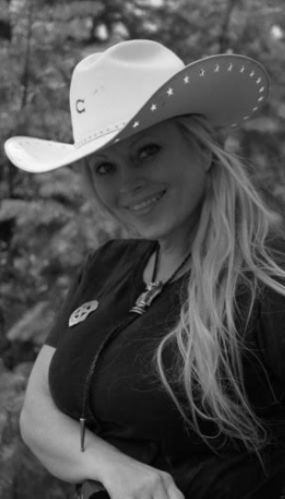 Inga specializes in paintings of wildlife, fish and western art, she has the ability to paint, draw and sculpt just about anything ; she enjoys fishing and studying the outdoors to put the realism into her paintings. When Inga goes snorkeling she studies the natural feel of the water and the fish’s natural environment, putting those elements into her paintings. Inga paints in many different mediums and likes to add materials such as sand and grass to canvas and will often add one of her hand tied one-of-a-kind fly fishing flies or lures to her artwork. When Inga is teaching, she shows the students that there are many different ways to make their art jump out at the viewer and how to bring the viewers into the artwork by incorporating these unique and different techniques as artist’s work becomes more life-like and realistic. Inga also does carvings in which she uses many different materials and adds things from the earth to give them a natural feel. Inga also works with many different materials and other artforms, from leather to wood to scrimshaw. Inga also teaches fly fishing classes for youth and women, leather working classes and various art classes, see page 12 and pages 18-21.